The image below shows some of the equipment used in our home-based system evaluator. Additional, newer equipment -- not shown in the image -- appears in the bulleted list below. 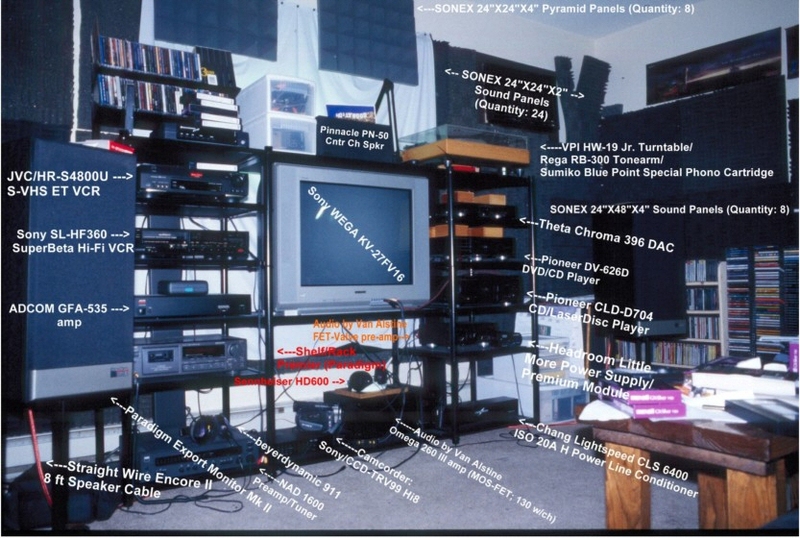 This system, used in conjunction with our computer-based evaluator, provides us with good, scientific insight into image and sound resolution from various source material. Various Toshiba and Philips/Magnavox CD and/or DVD players used as stand-alone or for transport. Asus Xonar ST audio card with selected opamps and low-jitter clock upgrade. The Sony television's gray scale, among other parameters, was calibrated to D6500 using the ColorVision SpyderPRO color analyzer and Digital Video Essentials and Avia DVDs.